It's said that half a million children go missing in India every year. Sonia Faleiro went to meet the parents of one, a 13-year-old girl who was walking along a road with her mother when she was pulled into a car and driven away. On the morning that I met Ram Bharan, a brick maker in a remote village in the northern Indian state of Uttar Pradesh, his family was in the midst of wedding preparations. The bride was Bharan's 15-year-old daughter. The sweet-faced teenager was seated on the floor of their mud hut, slathered with turmeric, in a pre-wedding ritual meant to purify the skin. But unlike any wedding ceremony I'd been to, this one was devoid of music, dance, even joy. The atmosphere was laden with sadness. 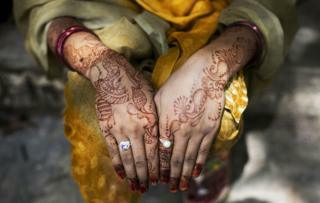 Ram Bharan hadn't planned to marry his daughter off so young. He was an illiterate, daily wage labourer, and like any father he wanted the best for his children. The legal minimum age to marry in India is 18 for girls, and Ram Bharan would have liked his daughter to finish her education. But in April last year, his youngest child was abducted. She was, he told me, 13 years, nine months, and three days old. Every morning Savitri accompanied her mother to the brick kiln, with a flask of tea for her father. The kiln was 20 minutes down a quiet mud road. But that morning, some men pulled her into a moving jeep. Her horrified mother could only scream as they drove off in a cloud of dust. The teenager is still missing, and she is just one among very many. Activists say that as many as 500,000 children go missing in India every year. Uttar Pradesh is a particularly lawless place, routinely registering the most crimes against women and children. After the abduction, Ram Bharan decided to marry off his remaining daughters - six in all - as soon as he could, to whomever was immediately willing. He could not protect them, he felt, so it was best to send them away. I was sitting opposite Ram Bharan on a charpoy. A lean man with a goatee and a thatch of salt-and-pepper hair, he wore khaki pants and a long sleeve shirt as protection from the cold. They were Shakya, he said right away, naming his caste. I hadn't asked, but caste was an introduction in these parts. The Shakyas are a low caste, so marginalised that they are beneficiaries of affirmative action. To be low-caste means to live suspended in insecurity and fear. With the abduction, Ram Bharan's fears were fully realised. The day after the disappearance he went to the police, he told me. He couldn't afford to ride the bus, so he walked. It took him two hours. He told the police what he'd learnt. One of the kidnappers was Ram Bharan's own neighbour. The police came to the village to look for the man, and when they couldn't find him, they demolished his hut to teach him a lesson. Then they left, never to return. When I visited the police station, there wasn't even a written record of his complaint. One officer who spoke to me was dismissive. "Girls run away," he said. I wasn't surprised by his response. Looking for a missing child requires time, manpower and resources, and the police in India are short on all of these. To avoid opening an investigation they pretend that no crime was committed. Savitri wasn't even the first girl to disappear in the area. According to village gossip, the neighbour who had abducted her was linked to a trafficking ring that supplied brothels in Mumbai and Delhi. When children go missing in India it's often because they are trafficked. But some children run away, hoping to make a better life for themselves. At least half of India's children live in acute poverty. They don't have adequate food or clean drinking water at home; some don't even have a roof over their heads. Some children are sold by their parents. Sometimes unwanted daughters are deliberately allowed to stray in busy market places. The government isn't doing as much as it could. And even if it were to empower the police, just finding a missing child doesn't get to the heart of the problem - which is that children need care and protection. India's courts have repeatedly denounced the prevalence of child disappearances - which they have declared "as bad as terrorism." When I returned to Ram Bharan to tell him what I had learned at the police station he recalled something else. The police had asked for a photo of his daughter, he told me. But there had never been money for photographs, not even a passport picture at the makeshift booth in the village bazaar. Now his child was gone, he sighed, and he had nothing to remember her by.